Hey folks! Long time no speak, sorry about being AWOL, I’ve been rather busy doing coursework, studying and working 😦 However, I’ve taken some time out to talk to you about one of my recent purchases. I feel like I’ve been through a bit of a change recently. I had a make-up cleanse around a month back where I threw a bunch of products away that I was just holding on to for the sake of it. I looked through my collection and thought about what products work for my skin type and tone. Once I came to this understanding, suddenly I haven’t been so obsessed with buying every new product I see but really thinking about where a product places into my lifestyle. I also feel like my everyday make-up routine has gotten a lot more relaxed, I’m not sure if this is a result of laziness or just having no time but I tend to gravitate towards very similar colours and products that are “low maintenance” or easy to wear everyday. Having said that, when I went out with one of my friends recently she was telling me about MAC Whirl and how I MUST buy it. Whirl has been on my wishlist for a while now but I’ve been trying to step away from MAC and try lipsticks from other brands too. Don’t get me wrong I love MAC but I do find their matte finish lipsticks really drying, on my already dry lips. So off I went and did some research for a Whirl dupe and came across this gorgeous colour from Urban Decay called 1993. It looks like 97% similar to Whirl but a teeny, tiny bit darker. I’d heard really great things about the formula of the matte revolution lipsticks, so I went online and purchased one. Currently there’s a lot of sales going on and I bought mine from House of Fraser for £13.95 over the original price of £15.50 (the same price as a MAC lippy). 1993 is a neutral-cool toned brown lipstick, very much “my lips but better”. I’m usually someone who prefers warm toned colours but this actually looks rather nice on me (even if I do say so myself!). It’s very 90’s, very Kylie Jenner and I absolutely LOVE it. The formula is one of the best matte formulas I’ve ever tried and doesn’t dry out my lips throughout the day. It dries matte but because it has a lot of nourishing oils in the formula it can smudge a little. It lasts around 6-8 hours before a top-up is required. Me wearing Urban Decay Matte Revolution Lipstick in 1993. Pulls a lot more pink in pictures but is definitely very brown in real life. This lipstick isn’t by any means a drugstore dupe but I think the formula is far superior to MAC Matte finish lipsticks and for a person like me who spends at least 12 hours out of the house each day, I don’t need to be faffing around with my lipstick or walking around with dry, flaky, uncomfortable lips, especially in this weather. 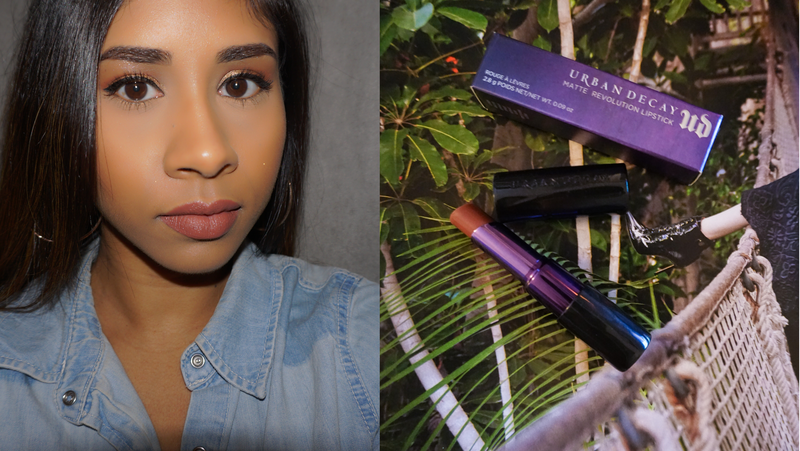 Urban Decay is slowly becoming one of my favourite brands and for good reason too. I can’t wait to try out more of their products. I can’t imagine working and going to school at the same time! This lipstick is GORGEOUS on you, and I agree, MAC is nice but the best lipsticks in town! If you can find a dupe in a nicer formula, it makes perfect sense. Cuuute! I totally get going for the more natural look. It’s easiest and IMO prettiest! Enhance what you got! Hey I have nominated your blog for the versatile blogger award! Oh nice!! It looks pretty moisturizing. I’ve never tried UD’s lipsticks, but I’ll be sure to look them up next time I’m at Sephora. Two weeks ago, I managed to get a tube of MAC Whirl. I was SO EXCITED because thanks to Ms. Kylie Jenner, it’s been sold out everywhere forever. I’m loving it (despite the dry quality)!!! Jay – getting a tube of Whirl was the hardest task of my life. Damn you, Kylie Jenner! LOL! I’m heading to Sephora tomorrow to get some stocking stuffers…I’ll definitely check them out! Thanks for the great review!